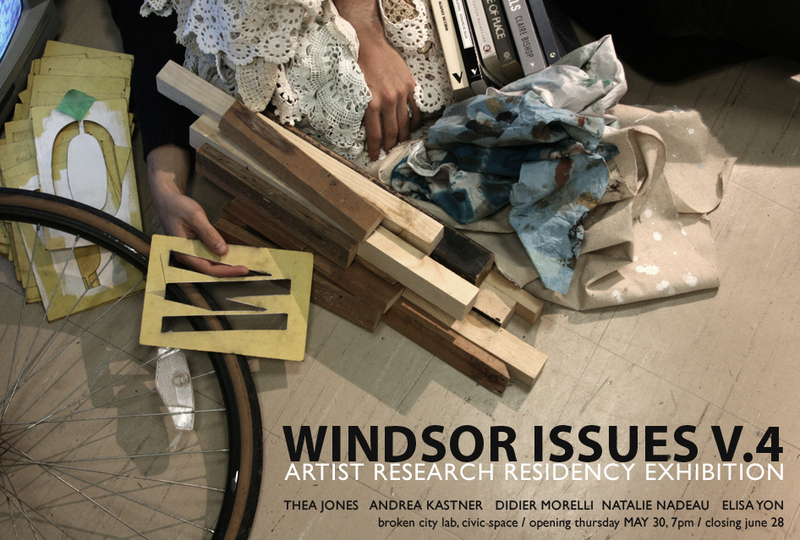 Windsor Issues is a culmination of the Emerging Artist Research Residency at the University of Windsor 2013. For one-month, five artists from across the country have been living, working and making art in Windsor. Research documentation, works in progress and experimental investigations are just some of the results of their labours. The exhibition will run from May 30th to June 28th, 2013, with an opening reception on Thursday, May 30th at 7pm. The participating artists include Andrea Kastner (Kamloops, BC), Thea Jones (Toronto, ON), Didier Morelli (Vancouver, BC), Natalie Nadeau (Essex, ON), and Elisa Yon (Vancouver, BC). Artist in Residence Elisa Yon will be holding a workshop outside Civic Space on Thursday, May 30th from 1-4pm (Rain Time: 7pm the same day) which will invite conversation and participation with visitors surrounding the types of foods created and consumed within the artist studio. Andrea Kastner is a painter living in Kamloops, BC, who creates work exploring the sacred nature of rejected things. Born in 1984 and raised in Montreal, she holds a BFA at Mount Allison University and an MFA at the University of Alberta. Her work has been shown in solo and group exhibitions across Canada. Her plans include upcoming solo exhibitions at Harcourt House, Hamilton Artists’ Inc., and Comox Valley Art Gallery. In 2012, she was finalist for the RBC Canadian Painting Competition. Andrea Kastner’s paintings of basements, alleyways and trash bring to light the hidden underbelly of things we seek to ignore. As part of the University of Windsor’s Emerging Artist Research Residency, she has been documenting the area of Windsor around her husband’s childhood home, which is now abandoned and boarded up. “Small Disasters” is a series of paintings which takes these images of Windsor and then uses a collage aesthetic to build them into surreal and ghostly cityscapes. Thea has also been conducting an ongoing mending service in her studio at the University of Windsor’s School of Visual Arts, where you bring her an article in need of mending and she will mend it for you. This is how she will save the world. During his stay at the Emerging Artist Research Residency, he has interacted with and in physical space and places around Windsor. Various individuals were encountered and a dialogue between his body and the city was developed through a series of task-oriented actions. The work remained experimental and process driven, focusing on play and chance. Featured at Civic Space for the duration of the Windsor Issues V.4 exhibition is a book documenting his one-month residency. It is composed of texts, images, collages, and drawings. Questioning conventions regarding the role of women and their relationship to domestic spaces in alliance with notions of time has driven my current artistic practice. The history of North American social attitudes towards domestic roles has led to further my interest in modern day suburban dwellings. Sculpture is one of the mediums in which I use to explore concepts of decorative and utilitarian objects found in domestic spaces. Elisa Yon is a Vancouver-based interdisciplinary designer and artist with a practice in socially engaged public art. As an architect by training, her research-based practice examines place-making through interventions that often engage a reflexive and ethnographic experience. Her experiments in designing cultural probes provide a framework for visitors, audiences and communities to intersect, contest and produce knowledge within public space. Using architecture and mixed- media installation, Yon examines the relationship between the social realms of design and site-specific practices in the making of place. The role of the table in the engagement of conversations, negotiations and the making and consumption of food became the focus of this research-based artist residency. Thinking of the table as a tool within the creative process became a way to explore some of the more subtle and intimate relationships we have with these everyday objects. The work, together with the workshop (on Thursday May 30th, 2013 from 1 – 4pm) invites conversation and participation with visitors surrounding the types of foods created and consumed within the artist studio.